Competition among small laptops is more ferocious than ever, and it appears that the once excellent U-Series is now struggling to keep its head above water. Asus has been on a roll lately. Everyone was surprised by the success of the recently released Eee Pad Transformer, which according to some figures is now the second best-selling tablet on the market. Critics have widely praised the subtly redesigned G74 gaming laptop. And according to Amazon, the company’s laptops and netbooks frequently make visits to their top 10 lists. For those who’ve had their on eye laptops for some time, this success isn’t a shock. Once known best for its motherboards, Asus regrouped and launched a new expedition into the laptop market several years ago. This has resulted in a host of consistently competent product lines. Among the most successful is the U series, a line of small laptops that offer outstanding battery life at affordable prices. Today we’ll be looking at the U36Jc, the latest 13.3-inch ultraportable to join the family. 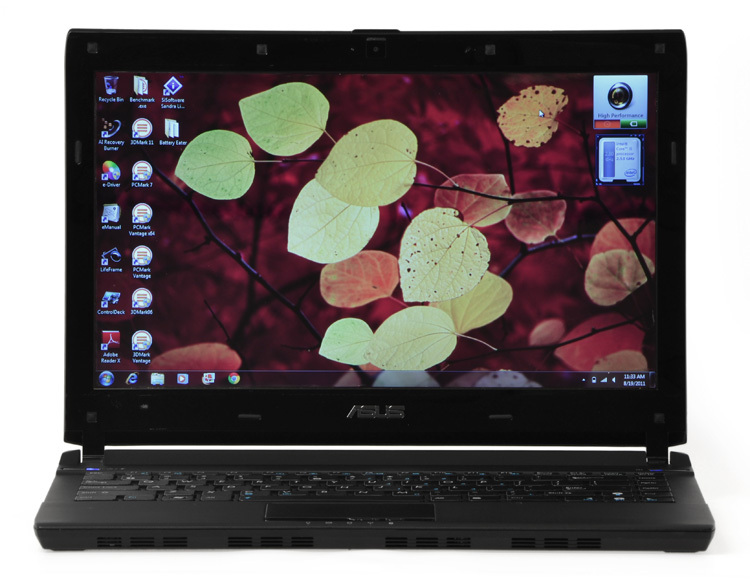 Asus has a long history of success in this class thanks to excellent battery life and affordable pricing. This model comes in at $800, however, yet only offers last-generation hardware such as a Core i5-480M processor and Nvidia 310M graphics solution. Do other qualities make this laptop competitive despite the use of outdated components? The U36Jc opts for a simple matte black finish. While the lack of gloss prevents fingerprints from becoming an issue, it also has a tendency to show dirt and scratches. Aesthetically, this leaves the U36Jc behind most competitors. It’s not easier to take care of, and it’s certainly not more attractive. This is one of the most boring laptops available today. Once you’ve worked around the drab exterior, however, there’s much to enjoy. As is boasted on the laptop’s interior badging, this model is constructed with AL-MG Alloy, which is an abbreviation of aluminum-magnesium. This is the same metal Lenovo uses in its ThinkPad line, and there is a similarity in the feel of the material. The entire bottom half of this laptop feels as if it was chiseled from stone, while the laptop’s lid allows for little flex. Build quality isn’t entirely up to ThinkPad quality, however. The display hinges are made of glossy plastic and there’s no durability enhancing features, such as a shock-mounted hard drive or spill-resistant keyboard. Asus should have put in these extra features if the company intended to compete with Lenovo. This design falls short of that high standard. At 0.76 inches thick and 3.8 pounds, the U36Jc is lighter than its predecessor, but actually a bit heavier than rivals like the 3.2-pound Toshiba Portege R705 and 3.6-pound Dell Vostro 131 (neither of which offer discrete graphics). Still, portability is never really an issue with the notebook. 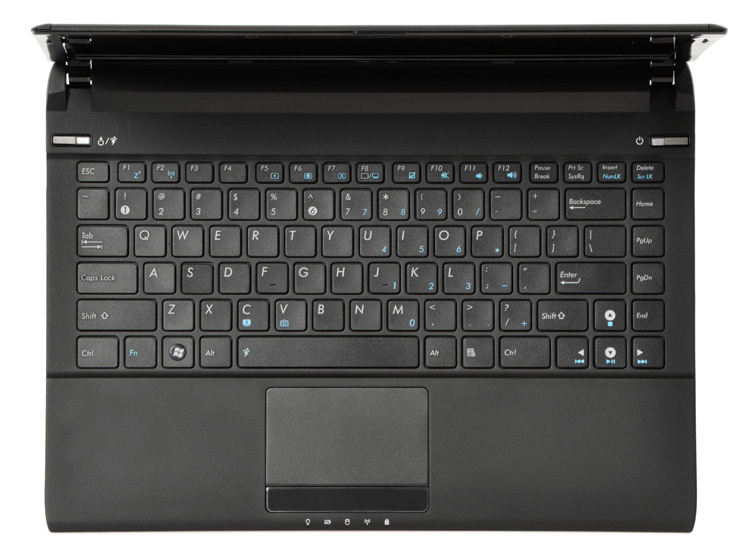 Keyboards on 13.3-inch laptops usually excel, most likely because these laptops are compact, tight, and usually lack optical drives, but this model is particularly solid. Each individual key is large, which makes touch-typing a breeze. Key feel is excellent thanks to long key travel and a stiff chassis that allows for virtually no flex. Since this is a 13.3-inch laptop, there’s no room for a numpad. Instead, a few function keys have been placed on the right side including Home, Page Up, Page Down, and End. The position of these keys can trick your fingers into thinking there is a numpad available, but adjusting only takes a few minutes. Below the keyboard is a moderately sized touchpad. It’s responsive and supports multi-touch gestures, but lacks texture and could be both wider and taller. A rocker button is placed below the touchpad, and like most rockers, it doesn’t work well. Button travel is shallow and there is a dead zone in the middle of the rocker that can be annoying. Users who open the U36Jc are likely to notice their own reflection before anything else. Gloss is found not only on the 1366 x 768 display panel, but also on the black plastic that lines the display. This only serves to make glare more difficult to ignore. As if this weren’t enough, the backlight is of average brightness, which makes this laptop unpleasant to use outdoors or near a window on a sunny day. Through the gloss is a display that’s utterly average. Black level performance is on par with most laptops, which means that dark images will often be lacking detail and appear washed out. Gradient performance is acceptable, but there is a grainy quality to the extreme dark edges of the test image. Dithering is likely the culprit. Poor black level performance combined with gloss results in a display that’s not well equipped to handle movies and games. Audio quality is also unimpressive. While slight bass is available, and music is remarkably balanced with little distortion, the volume is lacking. Moderate background noise can render the speakers useless. One circle around this laptop’s exterior makes it clear that connectivity was high on the list of priorities. Along the left flank there are HDMI and VGA ports as well as a single USB 2.0 port. Another USB 2.0 port can be found on the right, along with a USB 3.0 port, an SD Card reader, an Ethernet jack, and individual headphone and microphone jacks. That’s a lot of connectivity for a 13.3-inch laptop. Fan noise is audible while the laptop is at idle, but only in a room that’s almost entirely quiet. Under load is another matter. During benchmarks the laptop’s system fan spun up quickly and began its best impersonation of a hair dryer. Despite the loud fan, this laptop doesn’t stay cool enough to be comfortable. The bottom can heat up during lap use even when the laptop is performing simple tasks, such as document editing. Programs that put a strain on the processor and the graphics solution will make the bottom too hot for lap use, and even the palm rest begins to warm, particularly on the lower right hand side. Ports aside, there is one component missing: an optical drive. Most consumers who want a small, light laptop are unlikely to miss it, but it does make the laptop less suitable for users who want a laptop as their only computer. The Asus U-Series has always had a secret recipe for excellent battery life: Add one big battery to one small laptop, and presto! Class-leading endurance. No change has been made for this new model. 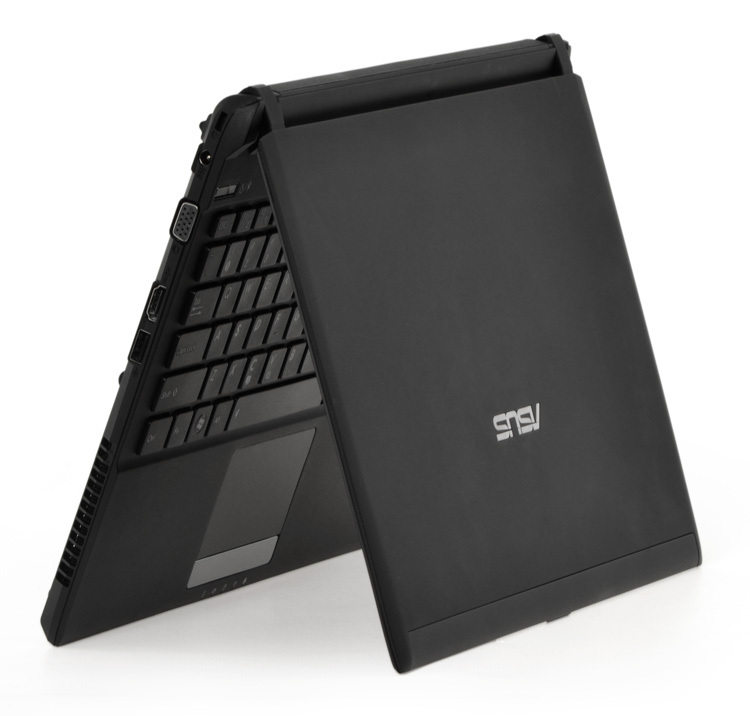 Most the rear of the laptop is taken up by the battery, which is a 5800mAh, 83Wh unit. Large as it is, the battery doesn’t protrude from the rear of the laptop and only slightly from the bottom. These results are excellent, and put this laptop at the front of its class. Even some netbooks fail to last as long. 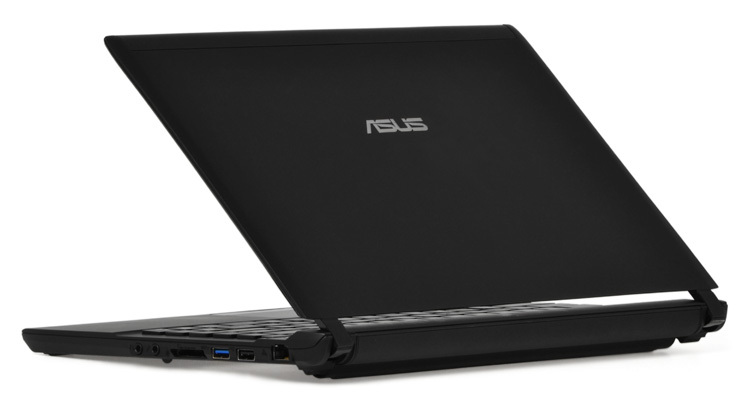 Like many laptops from Asus, the U36Jc comes with a wide variety of pre-installed software, much of which is of dubious quality. The LifeFrame software that’s installed for use with the webcam, for example, lags badly and has a confusing user interface. Similar criticism can be aimed at the ControlDeck utility, which provides access to numerous laptop functions such as display brightness. Although functional, the strange slide-up interface is slow and clunky and seems redundant, since most the controls are already on the keyboard. These programs aren’t thrust in the face of the user, however, nor do they take up much disk space. Simply deleting their desktop shortcuts is enough to banish them from bothering anyone again. One useful addition is a pair of pre-baked widgets that reside in the upper right hand corner of the Windows desktop. The first allows users to switch between High Performance and Battery Saving power management schemes, while the second provides information about the Core i5 processor’s current clock speed. Both are handy, and don’t rob the system of resources. The specification sheet for this laptop is a blast from the past. At the heart of the laptop is a first-gen Core i5-480M processor with a base clock speed of 2.53GHz as well as a Nvidia 310M mobile GPU with Nvidia Optimus to automatically disengage the discrete graphics to save battery life. These are joined by 4GB of RAM and a 500GB hard drive. If these parts sound familiar, it’s likely because ASUS shipped almost identical hardware in some trims of the earlier ASUS U-Series Bamboo laptops. Intel’s Core i5 processors are certainly nothing to laugh at, but use of a last-gen part does result in a performance penalty. For example, this laptop received a combined score of 33.39 GOPS in the SiSoft Sandra Processor Arithmetic benchmark. Models using the second-gen Core i5 often score 40 GOPS or better in the same test. PCMark 7 returned a score of 1,583, which is also a few hundred points behind laptops with newer Intel processors. Nvidia’s 310M can’t pick up the slack, either. It’s one of the oldest parts in the company’s stable, and it lacks support for DirectX 11 as a result. In 3DMark 06, the 310M managed to achieve a score of 3,524. That would have been a decent score last year, but it’s anemic by today’s standards. Both Intel’s second-gen Core processors and AMD’s Fusion A-Series processors have integrated graphics solutions that offer better performance than this discrete GPU. Disappointing is the best way to describe the Asus U36Jc. The company has had much experience in the construction of ultraportables, and seemed to have the formula mastered. Yet this new model has a number of inexcusable flaws. Worst among them is the hardware. There’s been plenty of time for an update to the latest Intel processors, and most laptops over $600 now make use of the newer hardware. Yet this model, which starts at $800, does not. Competing products such as Acer’s Timeline series, Lenovo’s ThinkPad Edge E420s and E220s, and Dell’s Inspiron 14z are a better performance value. The design also seems stuck in the past. Material quality is high, but build quality remains average. Sure, the aluminum-magnesium alloy makes the laptop sturdy, but it’s possible to construct a sturdy laptop without bleeding it dry of excitement. Not all the news is bad. Battery life rivals some netbooks, and is much better than most other 13.3-inch laptops. Praise must also be given to the keyboard, which is a joy to use. These few positives far from outweigh the issues facing this laptop, however. Competition among small laptops is more ferocious than ever, and it appears that the once excellent U-Series is now struggling to keep its head above water.